Will Your Home Hold Its Appeal? The time to think about selling your home is the day you buy a home. If you buy a home with good resale value, it should be fairly easy to sell if and when that time comes. But some homebuyers never consider resale value when they buy. They make the mistake of focusing solely on whether the home suits their own needs. But it might be pretty only to them. You hear agents repeat the phrase in triplicate: location, location, location. If you choose a home in a desirable location, odds are that location will remain in favor, which will always attract a larger pool of home buyers. Alternatively, if the location is less than desirable, it's possible that your future sales price will always be less than the other homes around it, and you may attract a smaller pool of home buyers. When it comes to location, you can't always anticipate changes that will impact your home's value, but you can try. You may not always be able to predict future changes, but be sure to educate yourself about anything that is already in the works. If almost every home in your neighborhood has only two bedrooms, owning a home with fewer than three bedrooms is most likely not a drawback. But it is a drawback if you're trying to attract, say, a couple or young family. Many couples need a guest bedroom and an office, if not an office for each occupant. A home with three bedrooms or more is always a better choice to ensure future resale value. Buyers will still buy a one-bath home but they expect to pay much less for it. Given a choice between a two-bath home versus a one-bath home, first-time home buyers will almost always opt for the two-bath home, even if the cost to install a second bath is much less than the price difference between the two homes. Moreover, it's not enough to simply have two or more baths. A home without a master bath may also suffer from a lower resale value. The term "family" is a bit misleading. A family space is any space in which a group of people can congregate. Whether to entertain friends or host a neighborhood gathering, buyers want an extra room that is spacious and informal. The days of the formal living room and parlors are over. People in the 21st Century collect too much stuff. They've got to store it somewhere. Walk-in closets are almost an essential. Homes with small closets are hard to sell. Even if the sacrifice is yard space, most buyers prefer a one-story home or at least a home with a first-floor master bedroom. But know your neighborhood. In neighborhoods with a mix of two-story and one-story homes, don't buy a single-level home surrounded by multiple-story homes as those have a bad home resale value. Unless you live in an urban area in which most occupants rely mostly on public transportation, you need a place to park your car, preferably two parking spots. If it's a covered, enclosed area, all the better. In the suburbs, you may encounter a resistance to homes with fewer than 3 parking spots in the garage. Few buyers want a chopped-up, closed-in space. Home buyers prefer natural light and open spaces, with a common sense flow that is interconnected without satellite rooms. A wing is acceptable; however, many families with young children do not want the master suite separated from the other bedrooms. Simple, do-it-yourself home improvements can greatly enhance a home's resale value. The two best rooms to remodel are the kitchen and baths. 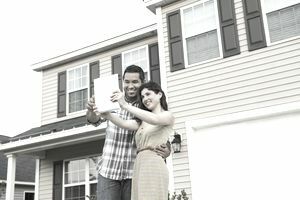 Home buyers prefer central heat and air, and some loans such as the energy efficient mortgage will provide for such updates upon purchase.